Haven’t decided on a hotel yet? 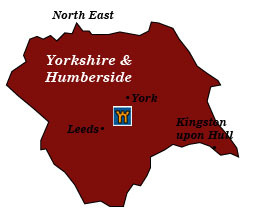 You can look at other available hotels in the region of Yorkshire and Humberside with Booking.com. Bleak moorland straight out of a Brontë novel, ragged coastline, broad sandy beaches, and some of the most dramatic scenery in England highlight this vast region. For two thousand years, Romans, Anglo-Saxons, Vikings, holy men of the Middle Ages, and industrialists have come here to make their fortunes and leave their historical footprint by the sheer numbers of castles, Gothic abbeys, churches, and grand country manor houses that mark the landscape. York The Normans laid the foundations of the glorious York Minster, the largest medieval cathedral in England. But the city’s origins began with the Romans and the Vikings. A walk along the nearly three miles of 13th-century walls is the best way to view this fine city. If you’re a railway buff, a trainspotter, or merely one with a nostalgic heart, don’t miss the massive National Railway Museum, with exhibits from the steam era, passenger cars used by Queen Victoria, and the only Japanese bullet train outside of Japan. Skipton Castle A gloriously preserved medieval castle, Skipton was built by the Normans in 1090 and later spared by Oliver Cromwell during the Civil War after a 3-year siege. Richmond Castle An enormous 100-foot-high keep, extensive walls, and the oldest Norman great hall in England stand guard above the historical town of the same name. Built in 1070 by Alan Rufus, first Norman Earl of Richmond, in later years the castle served as a military garrison. In WWI, conscientious objectors were incarcerated here. Scarborough Castle Ignore the kitsch that’s overtaken the seaside resort town and come up to the castle to enjoy the views. Some kind of fortification has been on this spot since the Bronze age. The present castle was built in the 12th century by William de Gros. It has the honor of never having been taken by assault, although a garrison did surrender during the Civil War due to starvation. Castle Howard Not a castle in the strict sense, but an incredibly opulent grand home that is the seat of one of England’s most renowned aristocratic families: the Howards. Visitors have flocked to the castle ever since it was filmed as the backdrop for the TV series Brideshead Revisited, based on the book by Evelyn Waugh. Haworth is a picturesque village that has been transformed into a shrine to the Brontë sisters, who penned their acclaimed novels—Wuthering Heights, Jane Eyre, and Agnes Grey—here. The Brontë Parsonage Museum displays many of their possessions and mementos. Harewood House A grand house built from 1759-1772, the superb grounds, butterfly house, and bird garden are as worthy of a visit as the home’s lavish interiors. The Adam interior boasts superb plasterwork and furniture especially designed by Thomas Chippendale. Harewood House is the home of the earl of Harewood, a cousin of the Queen. Yorkshire Dales National Park Walkers and cyclists can meander through a magnificent landscape of fast-running rivers, rugged hills and valleys dotted with ruined priories, stone walls, sheep farms, and tiny villages with rural pubs. North York Moors National Park Desolate moors, green valleys, and dramatic coastline, with the occasional castle and village in the distance have inspired many an English novel. In summer, the heather-covered moors explode into shades of lavender. Rievaulx Abbey Although fallen into dramatic ruins, the gorgeous site remains unspoiled. Founded in 1132 by French Cistercians, the abbey’s wealth grew until the Black Death and, later, the forces of Henry VIII decimated the monks. Whitby Of all the coastal resorts in Yorkshire, Whitby is the most interesting. Its prominence as a whaling port brought great wealth to the town. Famed explorer Captain James Cook (1728-79) was born here, and even more disparate, Bram Stoker set part of Dracula in Whitby. Dominating the town are the stunning ruins of Whitby Abbey, originally founded in 657 by abbess St. Hilda and rebuilt in the 11th and 13th centuries. A few miles south, Robin Hood’s Bay is an utterly charming village, with stone staircases and cobbled alleys winding path pubs and teahouses. Studley Royal Water Garden & Fountains Abbey A UNESCO World Heritage Site, the royal water gardens—a delightful world of lakes, water terraces, and grottos—enhance the Fountains Abbey. A rebel band of monks, who later became Cistercians, founded the abbey in 1132. Within 200 years, the abbey flourished and became one of the most successful in England.